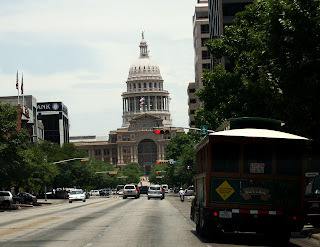 Recently a friend and I decided to visit the Austin Museum of Art (AMOA). Plugging AMOA into her car’s directional service took us first to Lagona Gloria. This is a lovely 1916 villa, which was once the home of legendary Texan Clara Driscoll. Clara Driscoll played a significant role in the preservation of the Alamo (very important to those of us from San Antonio). 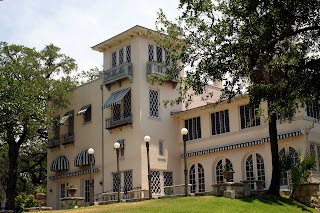 With a rich historical background and a lush 12-acre ground overlooking Lake Austin this beloved site has been declared a national treasure and is on city, state, and national registries of historic places. The grounds are lush and lovely with light braking through the dense canopy with dramatic effect. It's the perfect place to sit with a sketch book or for a slow romantic stroll. I am sure this beauty has inspired many works and at present Lagona Gloria is showing works by some of their instructors that were inspired by the property. After walking the house and grounds we headed downtown to see the exhibit Lewitt X 2. The exhibit includes not only works by Sol Lewitt but also from his personal collection. I enjoyed seeing the collection with a friend with who I could discuss my thoughts. And just as much I am now enjoying reading the exhibit program. I always by the program book when I see an exhibit I like. It’s my way of reliving the experience over and over again later. Plus I’m learning a few things in the process, background on some of the pieces I saw, their history, etcetera. Here I am enjoying the grounds at Lagona Gloria on a warm sunny summer afternoon. Sculpture is sprinkled throughout the grounds, some obvious others hidden surprises. I am very excited about the San Antonio Glass Art Guild’s (SAGAG) participation as a Merchant Group on KLRN’s 42nd annual Blazing Gavels. Blazing Gavels is a live television auction to support our local PBS programming. Members of SAGAG created over 27 items to be auctioned June 15th. We are thrilled for this opportunity to support a treasured local resource like KLRN, while bringing individual glass artists together to highlight our growing glass guild. SAGAG’s contributions were made possible by the many members who donated work and participated in the effort to collect and photograph them. But it was the inspiration and sheer determination of one outstanding member, Peter Ravdin, which brought it all successfully together. Thank you Peter! I contributed this cobalt blue set with a custom inlaid design. The set includes a 4” and 8” sushi style plate and oval platter. Look for it and other stained, fused and flame worked jewelery and functional items June 15th on KLRN. 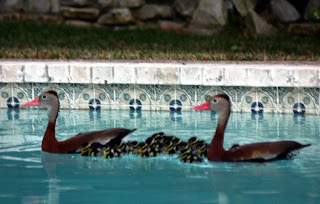 Two days distracted by ducks I haven’t set foot in the garage to work… It started Friday when my Husband called me at work to inform me our backyard pool was hosting geese. They were still there seven hours later when I arrived home. I was consumed by them. Dober (my loyal 4-legged companion) had to be walked out front as he can not be trusted lose with fowl. I spent hours watching them from the upstairs window, the side of the house, the back porch. It was momma, papa and approximately two dozen little ones. Being that just two days earlier I had freed a family of frogs from our pool filter and am presently trying to evict a family of four squirrels from the eves of my house, I’m beginning to feel like a nature preserve. 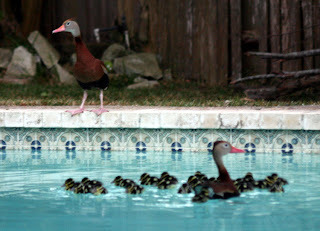 - The babies were helped out of my pool by the aid of a makeshift dock comprised of a few fence boards and a towel. - They faced the early morning advances of a Harris Hawk most likely called to breakfast by the constant chirping… Buffet! - And traveled from one neighborhood pool to another, some chicks with more successful then others. I did my best to remember that as cute as they may be these are wild animals. With a dedicated mother they did not need my interference. If a few were lost, and they were, that is natures way not that it did not sadden my heart. I want them all to grow up health, go to college and become doctors, lawyers and astronauts. In future, when I see these lovely creatures flying overhead I will always wonder if that is one of the little ones we hosted for a brief time. Good sources for information on the Black-bellied Whisteling Duck include The Cornell Lab on Ornithology and Wikipedia. Recently a few new sets made their way to Wired Designs Studio. 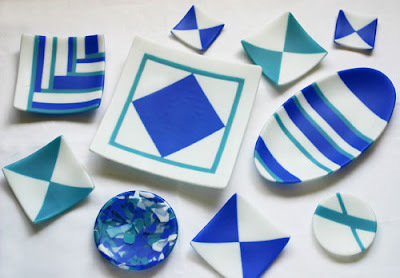 This refreshing set in blue and white includes sushi plates in various sizes from two to ten inches square, an oval platter and a six inch cast bowl. These pieces have a soft sateen finish and a crisp clean feel. 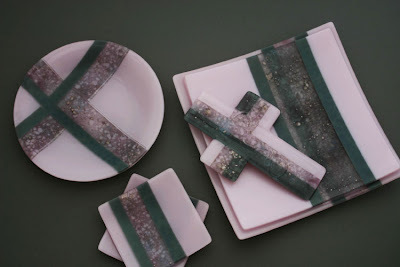 Pretty in pink this set includes square plates from four to ten inches, a nine inch round plate with raises detail and a cross. All are made with deco gray trim and a custom inlay that sparkles in pinks and silvers. They remind me a bit of cotton candy.